Spurn Discovery Centre in Yorkshire is now open! Simon King OBE, Award-winning photographer and wildlife broadcaster, was guest of honour at the celebratory event to mark the celebration of the New visitor centre gateway to Spurn National Nature Reserve. If you have a passion for watching wildlife this new visitor centre could make a great day out for all the family. Both the reserve and estuary offer beautiful views as well as offering insight into Spurn's heritage and the extent of the wildlife and habitats that can be found there. There is also a café and an educational space for school groups. I got in touch with Spurn Discovery Centre and they are happy to discuss possible Home Ed groups attending at reasonable fees. So if you're interested just get in touch! 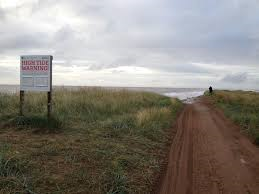 Why not take along this great guide here which includes a trail navigation map and local information such as Spurn's Historical past. Looking for more educational extension activities at Spurn? Check out some here for each Key Stage. Before planning your trip please check out their website here for some very important visitor information.